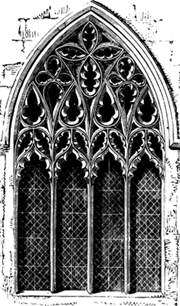 Tracery in which continuous curvilinear patterns (largely ogees) dominate. A characteristic feature of the Decorated and Flamboyant styles. Undulating tracery on the little arches, and the corbels and valances in the living room add grace to the space.